Most businesses need printed polythene bags for a number of uses, whether you’re marketing your business or differentiating your waste. You can also purchase polythene bags in a multitude of different colours that can even have your company logo printed on them. For many companies it is a requirement to have your details printed on waste bags so that the disposal management companies can identify the rubbish from your company. For a hassle free way of organising your commercial waste, polythene bags are the perfect solution for your business. There are a wide range of different options you can choose when it comes to printed polythene bags, not only can you choose from three colours, but you can also have the design printed on just one or both sides. If you’re looking for a unique or random pattern, our professional design team will be able to give you the ideal solution for your business needs. When it comes to waste clearance there is nothing more effective than polythene bags, simply because it allows your company to be differentiated from others with regards to waste disposal management. Printed polythene bags can also be used for recycling, waste segregation, charity collection, packaging for shipping and special products or events. All of the bags made from us are manufactured using top quality UK sourced polythene so you can be sure of their strength, quality and durability. These printed polythene bags in particular are environmentally friendly so that you can be sure you are doing your bit to protect the environment. All products can be fully recycled or they are manufactured using as little waste materials as possible. All waste is completely re-used to generate polythene granules that form part of the production of fresh film. Businesses should always be striving to reduce their carbon footprint and it seems that recyclable polythene bags can bring you one step closer to doing so. 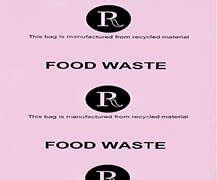 One of the best things about using printed polythene bags for waste clearance is the personalisation factor. Your bags will be completely unique to any other company, which allows you to dispose of your waste in the safest way possible. It also prevents your waste from being mixed up with any other potentially hazardous or illegal waste. No matter what size you need, you can order bespoke items to suit your business requirements. Whether you’re looking for a specific colour, opaque or tinted bag, there are also many options to choose from. If you’re looking to mask unwanted smells then there are also various fragranced bags to choose from such as lemon and vanilla. Whether you’re trying to organise clinical waste disposal, recycling, confidential waste or trade waste, there will be a polythene bag to suit your business needs. Keeping on top of your waste clearance should be high on your priority list, so choose printed polythene bags to make your job easier and more organised.